Zeesy Powers didn’t trample all over my soul like I thought she would. The way my heart was beating when I went into her show I Will Tell You Exactly What I Think of You at SummerWorks, clearly I suspected her of some terrible genius for laying people bare and confirming their worst fears. Thankfully, the show was much more interesting than whatever my fragile ego had in mind. I Will Tell You Exactly What I Think of You is pretty much exactly what the title suggests, except that Powers doesn’t appear to take any weird relish in being blunt or authoritarian. 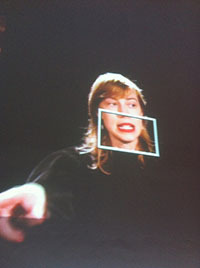 Performed in a talk-show format and live-streamed on the Internet, participants place themselves opposite Powers and submit to hearing some honest commentary. Powers is smart and funny and has the air of someone who’s traveled a long road of self-consciousness in order to be able get right into the present moment with another human. Her forthrightness seems hard-won—there’s something almost heroic about it. Which is just to say that she brings a lot to the table. Her powers aren’t magic though, despite what my gut was telling me. She’s just an “outside eye,” as she says. What makes the show brilliant isn’t her observations about people, which are certainly very insightful and entertaining, but the way the scenario itself triggers an expectation for the miraculous or the devastating. Maybe I need reminded that she isn’t an oracle because the performance felt so much like consulting a medium or a palm-reader. But Powers doesn’t pretend to know anything. “I’m talking about myself,” she often says, reminding us that all you can really know of a stranger is a projection. This point was illustrated unexpectedly at the show I attended, when author and playwright Sheila Heti took the stage. Powers meditated on Heti’s minor celebrity and how it created a false sense of connection or familiarity. This must be what it’s like, she realized: people think they know you, but they don’t. Many of us want celebrity, even though we’re dimly aware that it mainly brings awkwardness and complication. As Powers worked her way along this theme, with a visibly uncomfortable Heti as her token, I realized my own anxiety stemmed more from that deep desire for recognition than from fear of being insulted: I wanted her to see me for who I really am. In fact, Powers did recognize me. I’d sat in on a round-table discussion at the festival a few days previous, in which she’d gotten into a not-quite-heated debate with a few other creators of participatory performances. Toward the end, she asked the few of us in the room who hadn’t spoken to share our perspective, but I remained silent. At I Will Tell You Exactly What I Think of You, Powers observed that my aloofness makes me appear mysterious. This is a good trick, she hinted, if that’s what you’re going for. (I have a conflicted need to be chastised, so I extrapolated that I should be more open and talk more.) She also said I have sad eyes. I will tell you exactly what I think of Zeesy Powers: she’s actually nicer than I am. I was so worried about her judgment, it really surprised me to realize that my instincts about people were less generous than hers. “I think people want blood, but I don’t deliver blood,” she says. Being mean is boring; she’s a lot better than that. I Will Tell You Exactly What I Think of You plays at the Theatre Centre Incubator (1115 Queen Street West). All individual SummerWorks tickets are $15 at the door (cash only). Tickets are available online at http://summerworks.ca, by phone by calling the Ticketwise Call Centre at 416-907-0468, or in person at the SummerWorks Info Booth – located at The Theatre Centre (1115 Queen Street West) August 5th-17th from 10AM – 7PM (Advance tickets are $15 + service fee). Several money-saving passes are available if you plan to see at least 3 shows.